Franklin D. Roosevelt's summer home on Campobello Island. Travel writing is filled with stock phrases like stunningly scenic, breathtakingly beautiful and charmingly picturesque, but how many of you have descended on a destination and not had it live up to the adjective-riddled description in your guidebook? The dramatic coastline and pounding white surf were not quite dramatic enough, and the sunset you were setting up the tripod to capture looked nothing like the glorious photo-shopped version in the field guide. Travel is about satisfying our great expectations, and sometimes the mies en scene does not correspond to the well-defined picture in our heads or the Currier and Ives artwork in a travel brochure. At the same time, there are those destinations that exceed expectations. Elusive to even the seasoned traveler, Campobello Island is accessible year-round from the United States, and it takes off-the-beaten path and breathtakingly beautiful to a new level. Measuring just 10 miles long and 3 miles wide, Campobello Island is located at the mouth of Passamaquoddy Bay. However, here is where Geography 101 becomes confusing. 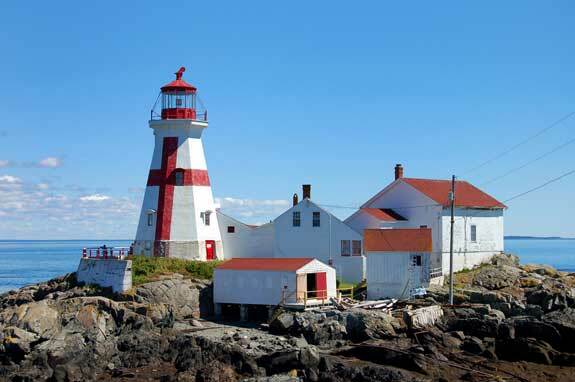 Campobello Island is a Canadian island. It is part of Charlotte County, New Brunswick. However, the Franklin D. Roosevelt Memorial Bridge physically connects the island to Lubec, Maine, which is the easternmost point in the U.S. It is easier to get to Campobello Island from the United States than from Canada. From Route 1 in Whiting, Maine, you take Route 189 to Lubec, and from there it is only a short ride over the bridge. You will pass through Canadian customs, so it is required to bring a passport, birth certificate and a photo ID. Remember: New Brunswick is in the Atlantic Standard Time Zone. It will be 1 hour ahead of Maine time. From 1883 to 1921, Franklin D. Roosevelt summered on Campobello, and he long referred to the place as his “Beloved Island.” Campobello Island was just one of many prosperous, seaside colonies and retreats that existed during that period in American history, as affluent families were continually seeking to escape the bustling cities for restorative ocean vistas. The following is how a 1890s travel brochure described Campobello Island:“The extensive forests of balsamic firs seem to affect the atmosphere of this region, causing a quiet of the nervous system and inviting sleep.” In other words, this remote island hideaway was where the wealthy came to take cure. Today, the island is a diverse mixture of elegant summer homes, fishing villages, shoreline walks, pristine golf courses, whale watching and enough mixed terrain to make every type of nature lover happy. From the wild and ragged coastline to the spectacular views of the Bay of Fundy, the landscape is as varied as the tides. On this small swath of Canadian soil you will not only find the Roosevelt Campobello International Park, but also the Herring Cove Provincial Park. In other words, it is still an ideal place to take cure. 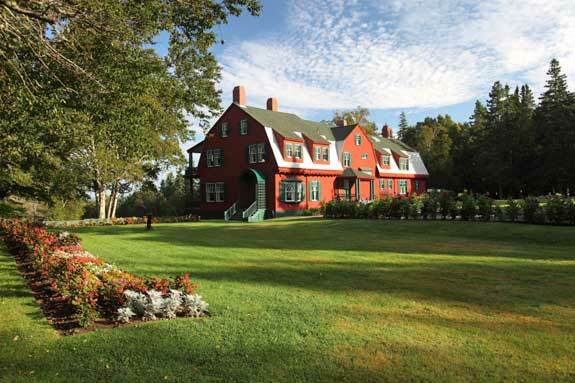 The Roosevelt Campobello International Park is jointly owned and operated by the United States and Canada. It is opened daily, 9-5, from Memorial Day through mid October. There are free outside walking tours of the estate. Dogs are allowed on the property but they cannot be left unattended. Small children are also welcome. Be sure to check out the Visitor Centre to get a thorough lay of the land. Brochures, trail maps, birding and bog guides and a short video on the history of the grounds are available. While the actual cottage that FDR summered as a child is gone, the highlight of this 2,800-acre park is the 34-room Roosevelt Cottage. This building was originally a wedding gift to Franklin and Eleanor, and it is painstakingly maintained just as the family left it. The grounds also include the Hubbard Cottage. The East Quoddy Head Lighthouse is just beyond the park. It is a white lighthouse adorned with a large, red cross. This is a whale-watching hotspot, but it is only accessible at low tide. All in all, the park has eight miles of inland and shoreline hiking trails. It also has fifteen miles of park drives, which were once a network of carriage roads. If your time is limited, be sure to take a driving tour. The Cranberry Point Drive and the Liberty Point Drive both have access to picnic sites, views of the beaches, lighthouses and the Bay of Fundy. Once you have traveled this far, the only place left to go is deeper into Canada. The French town of St. Stephen is only a hop, skip and jump away.